""Thinking in Java" should be read cover to cover by every Java programmer, then kept close at hand for frequent reference. The exercises are challenging, and the chapter on Collections is superb! Not only did this book help me to pass the Sun Certified Java Programmer exam; it's also the first book I turn to whenever I have a Java question." "--Jim Pleger, Loudoun County (Virginia) Government"""Much" better than any other Java book I've seen. Make that 'by an order of magnitude'.... Very complete, with excellent right-to-the-point examples and intelligent, not dumbed-down, explanations.... In contrast to many other Java books I found it to be unusually mature, consistent, intellectually honest, well-written, and precise. IMHO, an ideal book for studying Java." "--Anatoly Vorobey, Technion University, Haifa, Israel""Absolutely one of the best programming tutorials I've seen for any language." "--Joakim Ziegler, FIX sysop""Thank you again for your awesome book. I was really floundering (being a non-C programmer), but your book has brought me up to speed as fast as I could read it. It's really cool to be able to understand the underlying principles and concepts from the start, rather than having to try to build that conceptual model through trial and error. Hopefully I will be able to attend your seminar in the not-too-distant future." "--Randall R. Hawley, automation technician, Eli Lilly & Co.""This is one of the best books I've read about a programming language.... The best book ever written on Java." "--Ravindra Pai, Oracle Corporation, SUNOS product line""Bruce, your book is wonderful! Your explanations are clear and direct. Through your fantastic book I have gained a tremendous amount of Java knowledge. The exercises are also "fantastic" and do an excellent job reinforcing the ideas explained throughout the chapters. I look forward to reading more books written by you. Thank you for the tremendous service that you are providing by writing such great books. My code will be much better after reading "Thinking in Java." I thank you and I'm sure any programmers who will have to maintain my code are also grateful to you." "--Yvonne Watkins, Java artisan, Discover Technologies, Inc.""Other books cover the "what" of Java (describing the syntax and the libraries) or the "how" of Java (practical programming examples). "Thinking in Java" is the only book I know that explains the "why" of Java: Why it was designed the way it was, why it works the way it does, why it sometimes doesn't work, why it's better than C++, why it's not. 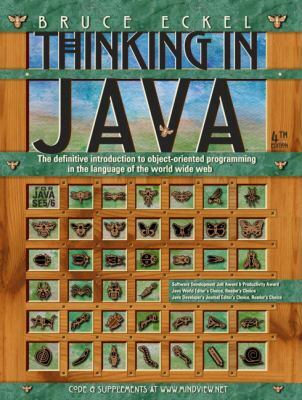 Although it also does a good job of teaching the what and how of the language, "Thinking in Java" is definitely the thinking person's choice in a Java book." Download seven free sample chapters from "Thinking in Java, Fourth Edition." Visit http: //mindview.net/Books/TIJ4.